Franz F. Isaak (27 September 1876-14 May 1944) was born in Tiege, Molotschna, South Russia. He taught school in the Don area ten years, in Nikolaifeld, Bezabotovka, and Millerovo. In 1898 he was converted and joined the Mennonite Brethren (MB) Church by baptism. 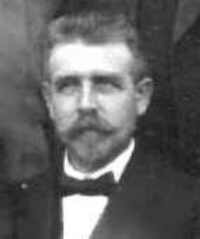 He married Aganetha Dörksen in 1899. He was elected to the ministry in the MB Church and ordained in 1911. He served as minister in Millerovo. He immigrated to Canada in 1925 and settled in Winnipeg, where he served the MB Church as minister for many years and for some time as leader. He was also a member of the MB Canadian Conference city missions committee. For many years he was employed by the British and Foreign Bible Society in its Bible House in Winnipeg. He died on 14 May 1944. Isaak, Aganetha J. "Isaak, Franz F. (1876-1944)." Global Anabaptist Mennonite Encyclopedia Online. 1957. Web. 20 Apr 2019. http://gameo.org/index.php?title=Isaak,_Franz_F._(1876-1944)&oldid=122139. Isaak, Aganetha J. (1957). Isaak, Franz F. (1876-1944). Global Anabaptist Mennonite Encyclopedia Online. Retrieved 20 April 2019, from http://gameo.org/index.php?title=Isaak,_Franz_F._(1876-1944)&oldid=122139. This page was last modified on 14 May 2014, at 15:22.